A full five years after 2010's Norrøn Livskunst, mad Norwegian duo Solefald are back with their eighth full-length, and as I was hoping after being slightly bored by last year's Norrosongen – Kosmopolis Nord EP, it's a return to the avant-garde territory that made them (in)famous. On initial listens, World Metal – Kosmopolis Sud is downright obtuse, filled with screeching noises and electronic beats; those easily irritated will have a hard time. But under the surface silliness, as usual Solefald have crafted a deep and interesting album that will please fans and advance their reputation as Norway's most out-there metal band. Not 'Norway's most out-there black metal band', of course, because Solefald haven't really been black metal in years. Their music may have 'black edges', but even in the early days the band preferred 'red metal', and as opener World Music With Black Edges states, they've continued to evolve since then, to the point where they often sound like a calmer but more varied Vintersorg. Opening with piano, percussion and flute, the layers quickly become overwhelming once both vocalists join in, and the song gets more complex from then on, structurally intense with frequent changes and even disco beats. Yet this isn't avant-garde in the total chaos sense, but in that it's unpredictable and extremely varied – a lot of this is built upon prog metal foundations, and it's often very pleasant and easy to listen to. The Germanic Entity is a good example, with orchestral keyboards and what sounds like a xylophone, despite its eight minute runtime. There are exceptions of course, and fans of Agnete Kjølsrud will be pleased with the nonsensical falsetto singing that opens Bububu Bad Beuys, the track continuing to be the most vocally eccentric on the album, sounding like Devin Townsend off his meds at moments. I think Solefald are at their best when making full use of their hook-writing skills, however. There's a return to Neonism-esque urban alienation in Future Universal Histories, together with a serious contender for the band's catchiest chorus since Mont Blanc Providence Crow. And there's genuine sadness to 2011 or a Knight of the Fail, where Solefald take on the topic of mass murderer and terrorist Anders Breivik in the album's most straightforward track (which isn't saying much). 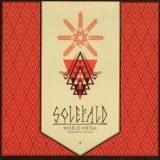 World Metal – Kosmopolis Sud gives the impression that even more is going on beneath its surface – I wish Solefald (and other bands) would make their lyrics more widely available, for example. But this is another artful album from a band that have had something of a shaky reputation at moments, what with the not universally admired Icelandic Odyssey albums and relative quiet since 2010. This is very much a return to form, however, and makes a great follow-up to Norrøn Livskunst, if not quite being as good.